The Los Alamos Historical Society preserves, promotes, and communicates the remarkable history and inspiring stories of Los Alamos and its people for our community, for the global audience, and for future generations. We do this through the Los Alamos History Museum, the Los Alamos Historical Society Archives and Collection, publications through Bathtub Row Press, ownership and interpretation of historic buildings, educational programs such as our lecture series, and more. A native New Mexican, Heather spent 14 years in exile before returning to her beloved Land of Enchantment in 1999. She has bachelor’s degrees in journalism and political science from Drake University in Iowa and a master’s in U.S. history from the University of South Florida. A love affair with Fuller Lodge led to Heather's employment with the Los Alamos Historical Society over a dozen years ago. Aimee has called Los Alamos home for a few years now and enjoys the opportunity to share our history with visitors to the museum and the community. She earned her PhD in the History of Science, Technology, and Medicine program at the University of Minnesota. She's learning to sing with the Los Alamos Choral Society. Rebecca has been with the Society for almost 30 years. She earned both a BA and an MA from the University of New Mexico with a concentration in Far Eastern History. Her specialty is photographic collections, and she added digital image capture to the archive's capabilities in 2004. As the curator, Don is responsible for the conservation, preservation, restoration, and cataloging of the Los Alamos Historical Society's three-dimensional artifact collections. Stephanie holds a BA in history from New Mexico State University. As the third-generation of her family living in Los Alamos, Stephanie has a passion for preserving and telling the stories of her hometown through her work in the Historical Society's archives. Todd is almost a Los Alamos native, having moved here as an almost-two year old. He is a Los Alamos High School graduate and holds two degrees in applied sciences from Metropolitan Tech in Nebraska. Before becoming the manager of the Museum Shop in 2016, he ran the Bandelier National Monument concessions and gift shop for eight years. He has enjoyed acting experience in TV and films and now pursues skiing, hiking, and the outdoor life around the plateau. ​Michelle came to Los Alamos in 1980 from Lawrence Livermore Laboratory and hired on at Los Alamos National Laboratory later that year. She worked as a nuclear procedure writer developing operational and technical procedures implementing LANL’s nuclear safety basis. She holds a bachelor’s degree from Queens University in Charlotte, North Carolina. Michelle has owned and operated a small greeting card publishing company in Los Alamos for many years, and her photography of northern New Mexico landscapes is well known. Sharon Snyder is the author of At Home on the Slopes of Mountains, a biography of New Mexico poet and author Peggy Pond Church. She also coauthored, with Toni Michnovicz Gibson, Los Alamos and the Pajarito Plateau. Sharon is a historian interested in northern New Mexico history, focusing on Los Alamos, Santa Fe, and the La Junta Valley. 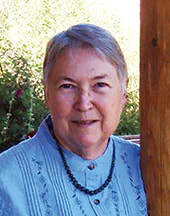 She serves on the board of directors of the Los Alamos Historical Society. Sharon holds a bachelor’s degree from the University of New Mexico and a master’s from New Mexico Tech. The offices of the Los Alamos Historical Society are located in historic Fuller Lodge in the center of Los Alamos, New Mexico. 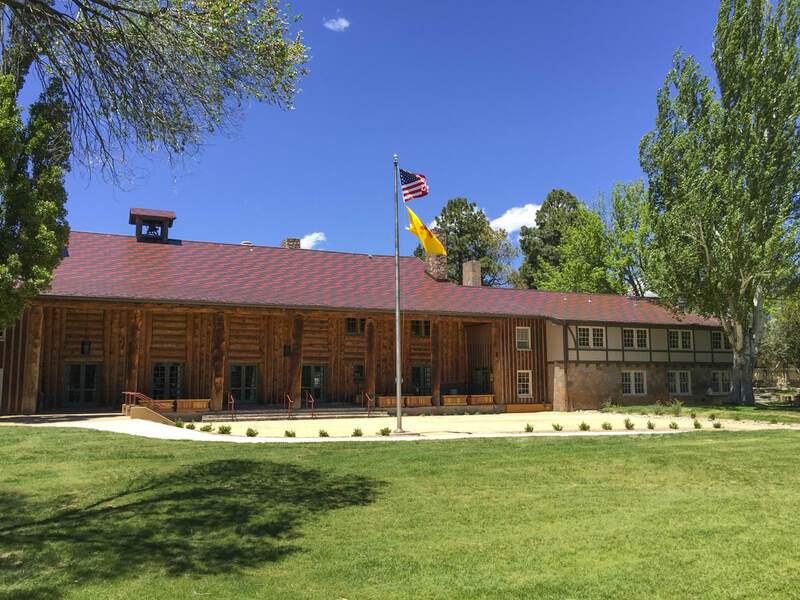 Designed in 1928 by John Gaw Meem for the Los Alamos Ranch School, and later used by the Manhattan Project, Fuller Lodge is now a public building on the National Register of Historic Places and hosts many community events.